Berry's recent village got me thinking how we need to implement something we've discussed before, before adding future Reachman settlements (or at least have it in mind). The villages should mostly one tribe each, though we should define a name and some characteristics of each tribe, as well as who their matriarch is. In general there's some correlation between the Velothi underclass and the Ashlanders of Vvardenfell and the city-dwelling Reachmen and their wild, tribal counterparts. We should strive to not make them Ashlanders 2.0, but I think we can take some inspiration from them when developing some differences. Different economies. Some are mostly hunters, foragers and gatheres, others have agriculture and maybe mining. Different attitudes. From hostile and against "foreign" influences (Nord rule), while others are more open to trade. Most Reachmen long for independence though, but there should be some variation in how strong this shows. Marauders raid and attack trade caravans, travellers and Nord settlements. Some could be more focused on magic or revering the old gods, other tribes seeking counsel of the latter. For instance, I picture Worsas' canyon village to be a semi-wild tribe, not openly hostile, but with limited communication to outsiders. The economy is based on hunting in and around the canyon and keeping a few farm animals (mostly goat herding), and foraging the area for berries and wild vegetables. We should also have an overview of villages and smaller settlements (including cave dwellings), so that we can work from this. I know that that well-hidden Reachmen village in the forest (a piece of forest outside of the old release boundaries) was intended to be hostile to outsiders. A sketch for the outline of the ten kingdoms of the Reach, the ten greatest tribes (of the past). Most of these are gone by now, with some of them only having a single camp still claiming the tribe name, or completely decimated. 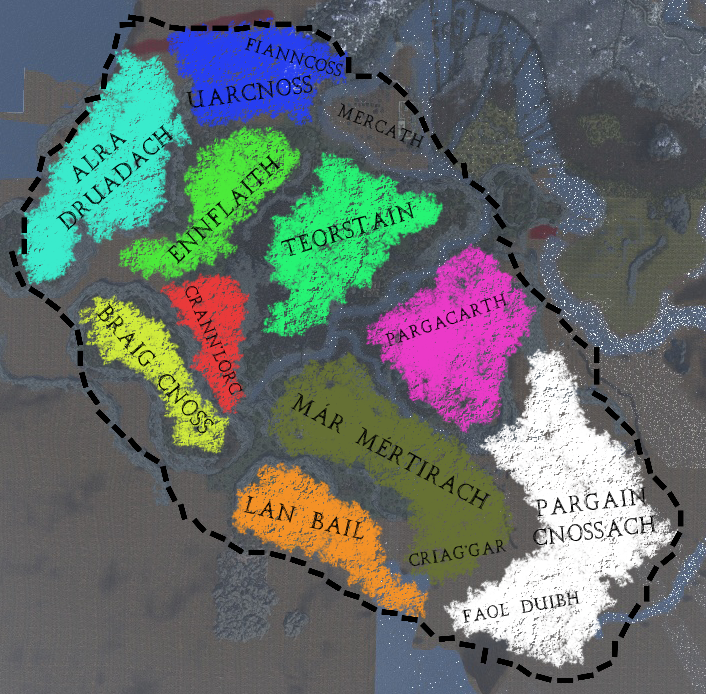 The Reachspeech names are just placeholders and region names, not tribe names. This is more to show how the Reach could be divided, though I'm thinking the Western Reach tribes could be included in the famed ten tribes of Yeti-lore. A draft like this one is a great idea to get some ideas rolling. Maybe we should indeed extend our reachmen lore to areas outside of these boundaries later, as I personally think you should encounter some of them in western haafinheim aswell. And certain tribes in highrock could be referenced aswell, if only in dialogue. How about saying that the so-called Breton towers were creations from the time of Reachmen independence (at a different state of civilisation)? How is the timeline anyway? -First there were the nedics and perhaps a different branch of Atmorans? -The first empire of men conquered and Nords ruled the space? -The Bretons and Reachmen took over. This would be the time of the Reachmen kingdoms, right? - Nords and Redguards took over again. Would that be roughly correct? I think that's the rough outline. Just how much attention the Direnni paid to them can be discussed, and I'm sure they had at least some sort of self-governance during that period as well. I think the Breton towers are too distinct from what we're trying to achieve. Perhaps they can be High Rock border forts or whatever, a relic from when Jehenna or Evermore ruled the area (did they? ).